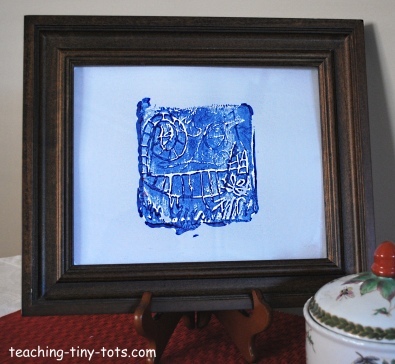 Toddler Activities: A green craft using styrofoam trays to print. Reuse styrofoam veggie and meat trays and make your own print. Use a pencil to make a pattern, design or picture on the flat side of the styrofoam tray, add some paint and make some colorful prints. Washed meat or vegetable trays. We found a four pack of tomatoes with a tray that had no markings on the bottom. Frame or Construction paper to mount on. Draw with a pencil, trying not to puncture tray. When your child is finished, go over the lines with a sharper pencil to add more definition if necessary. 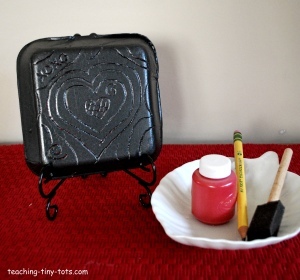 Pour tempera paint into small dish or lid for roller. Roller produces smoothest results. You could probably use a regular paint brush as well but we didn't test it. Roll or brush paint onto pattern. Turn tray over onto test paper and rub the back gently in all areas to ensure best print results while making sure the tray does not slide. Do a couple test prints on scratch paper to see how much paint you need or if you need to deepen some of the lines. Lift tray gently from paper making sure not to slide or drop tray. Add more paint if needed and press onto your watercolor paper or cardstock. Let dry. Frame or mount on construction paper. Look at the bottom of the tray for ones that are unmarked. Keep it about 5 x 5 for best results and easier printing. Test a few to get the results desired. Deepen any lines necessary but try to keep it your child's work! We used a brayer and a sponge brush. The brayer has a slightly smoother finish. Patterns are the easiest but my animals can be made too. This would make a simple, inexpensive toddler activity at a birthday party. Words are tricky but you might find a few palindromes which are words that can that can be read the same way in either direction MOM is a palindrome and the letters look the same both ways so this makes a great Mother's Day Print! DAD is tricky and although it is spelled d-a-d both ways...you have to flip the letters. If you do try it, write it on a paper and use a mirror to see if it is correct. Patterns are easier but animals can be made too! 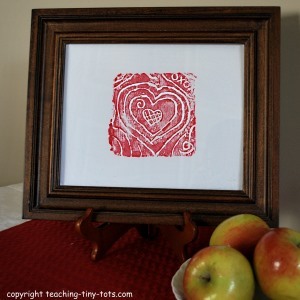 This project can make great toddler activities. 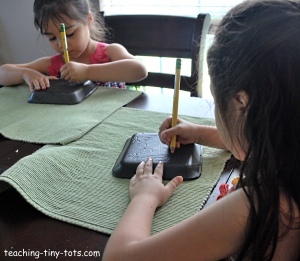 By using several trays and making a different shape on each would make a great way to reinforce shape recognition. Don't forget to talk about colors and size.